Up until last week, when I thought of Benidorm, I pictured tightly packed skyscrapers, rows of bars boasting happy hours and sunburnt groups of English stag and hen parties trawling from one pub to the next for yet another cheap pint; all making me feel a tiny bit embarrassed to be English. So when the Spanish Tourist Board invited us to join a blog trip to explore things to do in Benidorm for families, I was intrigued about what we might discover in this town notorious for partying. So is Benidorm family friendly and if so what can it offer families? Quite a lot it would seem! 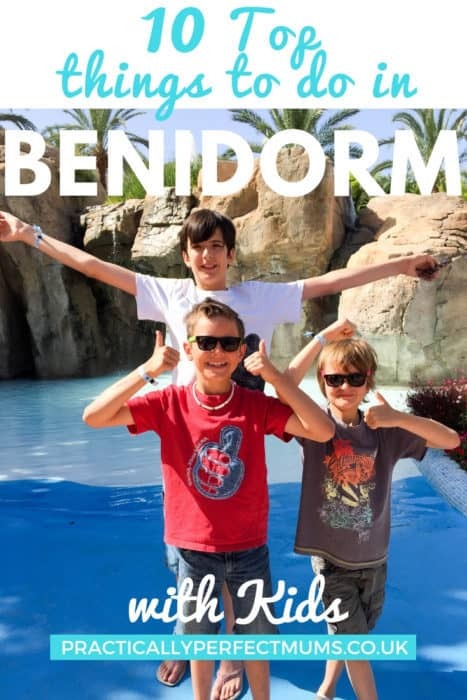 Following our action packed family break with an expert guide showing us the best places to visit and a little research of my own, I’ve compiled a list of top things to do in Benidorm for families. 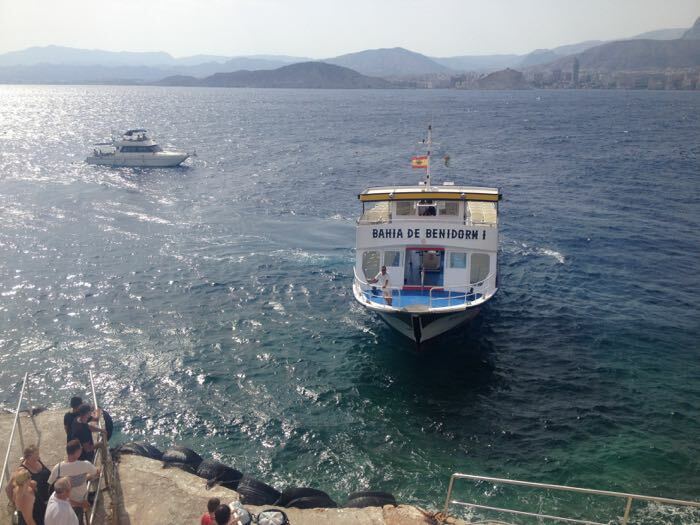 This is a great option for a sunny day – of which there are plenty in Costa Blanca. 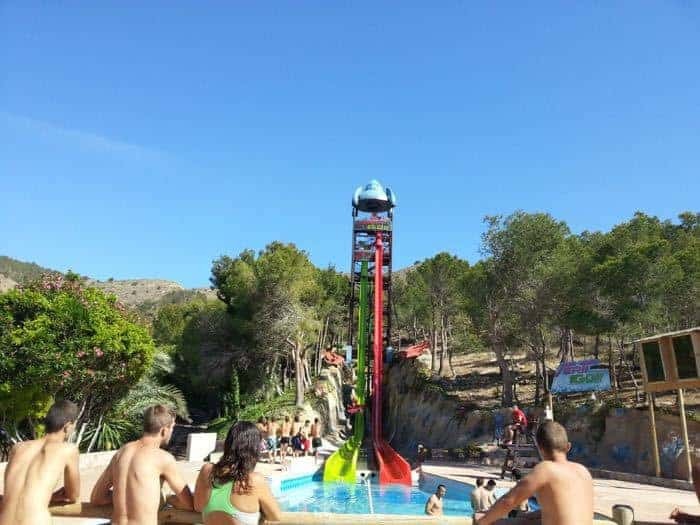 Despite the heat, children and adults alike are happy to climb the numerous steps required to reach even the highest water slide. My 6 year old’s favourite ride is the black hole, which is enough of a nail biter for me. The 9 year old also likes the black hole but prefers the virtually vertical drop offered by the Verti Go. It’s like a regular death slide but with the added “benefit” of having a trap door which suddenly opens and drops its victim 34 metres at an alarming rate. Perfect for the adrenaline junkie. I’ll be the one holding the camera. There are also plenty of far more sedate rides and water play areas for even the youngest and most timid of us at Aqualandia! where you can go exploring, have a swim or enjoy a relaxing drink on the terrace overlooking the bay. After an early morning start from Bristol, we can highly recommend the latter to get you in the holiday mood! I was relieved to discover it doesn’t go completely under water but is kind of a mix between a glass bottomed boat and those reinforced glass walls in a seaquarium at the zoo. 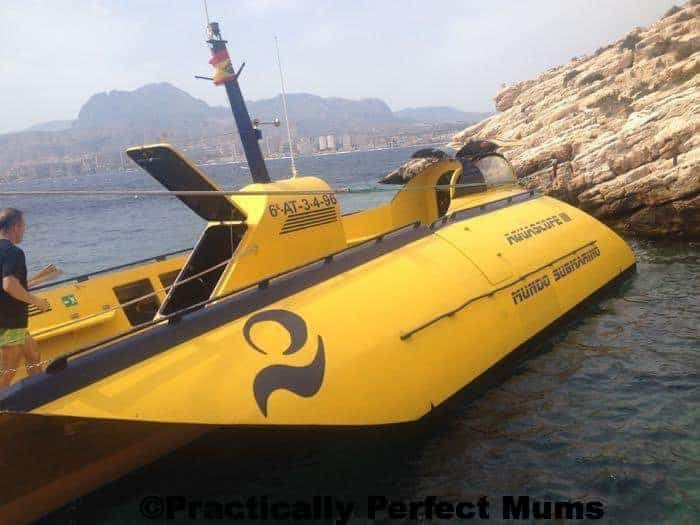 You can catch the submarine from from Benidorm Island and this is a brilliant way to see how clean the sea bed is and get up close to the native sealife. I could swear that I recognise one large fish, frantically trying to keep up with our boat from “Finding Nemo”. OK, I admit I didn’t think it sounded that exciting beforehand but, wow, the action had us on the edge of our seats! The dolphins and their keepers put on a spectacular show. So taken am I by their acrobatic stunts, I’ve put together a short Dolphin Show Video. 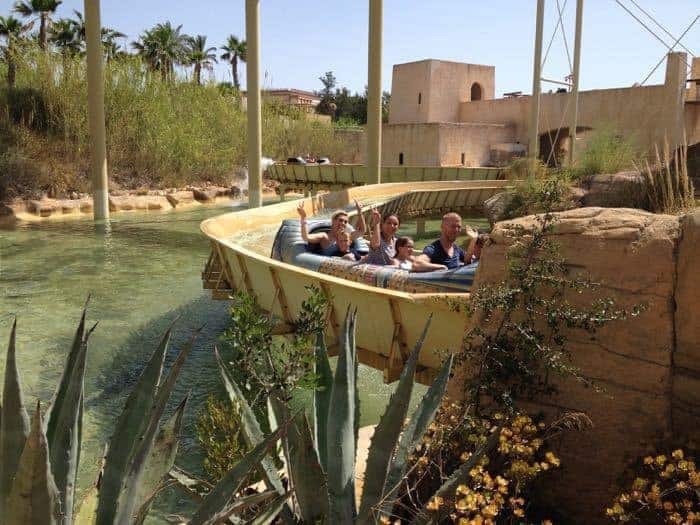 5- Hold Onto Your Hat at Terra Mitica Theme Park! 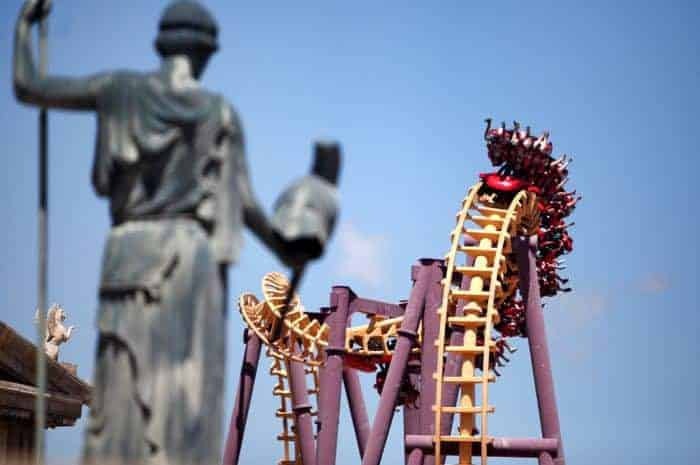 Resembling a Disney park, Terra Mitica theme park recreates classical Mediterranean civilisations with rides catering for a range of ages. My 9 year old enjoys plenty of rides including the mini wooden roller coaster but is disappointed to be a couple of centimetres short of the 140cm height minimum for the fastest, most furious of them. He’s hoping for an imminent growth spurt so we can make a return visit and go on them next year! My more timid six year old adores the traditional swing chair ride Icarus. I’m a bit of a wuss and don’t like roller coasters. The water rides offer excitement enough for me! I also like the 5D cinema which simulates a roller coaster as I know I can shut my eyes if it gets too scary. At 11, 9 and 6 my boys are old enough these days that the husband and I can take them out for a meal and the whole family can enjoy the experience. (Not that I want my boys to grow up too quickly but I’m glad to say that attempting to cut up my dinner with one hand, while supporting a breast feeding baby with the other are becoming dim and distant memories, along with those spectacularly badly timed nappy changes . 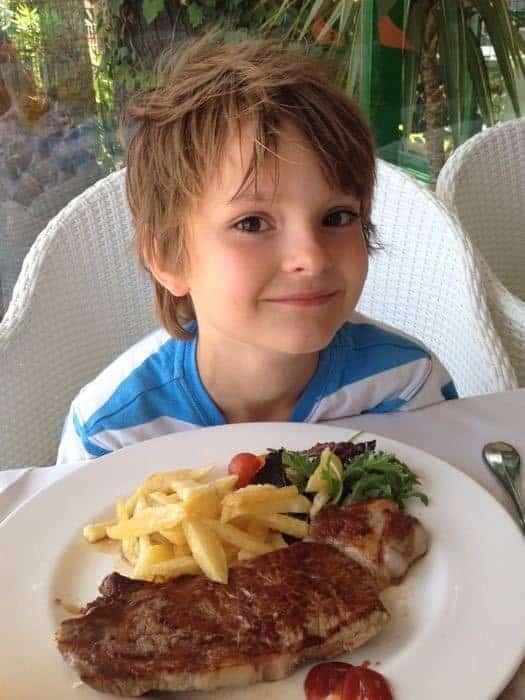 . .) Whatever the age of your children, there are plenty of family friendly restaurants to choose from in Benidorm. 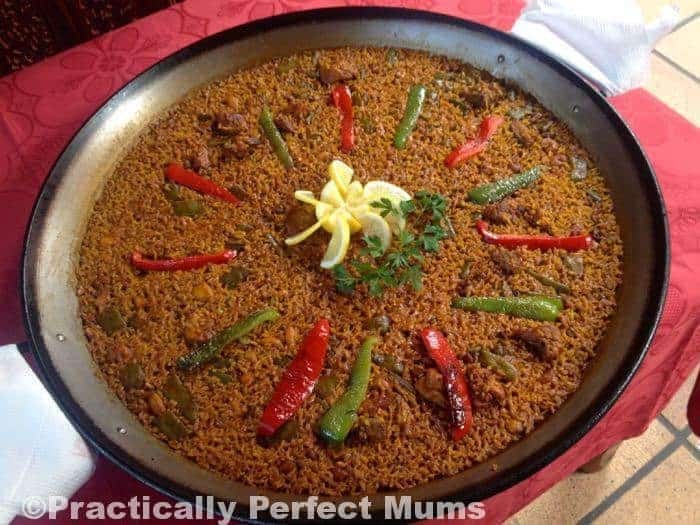 My six year old lists eating this giant paella in the restaurant at Mundomar Animal Park amongst his favourite parts of the holiday. Everyone agrees it was quite delicious – an unexpectedly impressive offering for a zoo restaurant. We also rate Restaurant Ulía, which is set in a beautiful location overlooking Poniente beach. 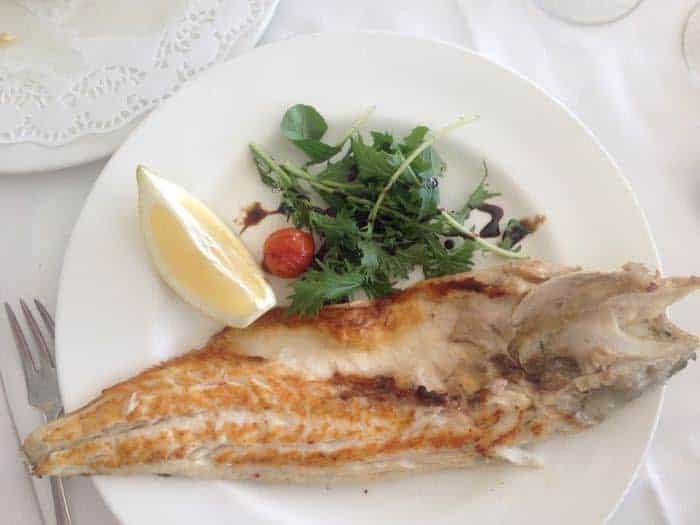 As part of a set lunch our plates are filled with one elegantly presented treat after another, culminating in an enormous, melt in your mouth sea bass for the adults and an adult sized succulent entrecôte steak for the boys. Look at the size of that child’s portion! On the plane back to Bristol, I pick the brains of Paul, an expat Father of two girls and Benidorm resident to find out where he enjoys going with his family. He explains that they have a regular membership to Mundomar animal park as they like to visit the zoo as a family (and Aqualandia next door) most days in the summer. 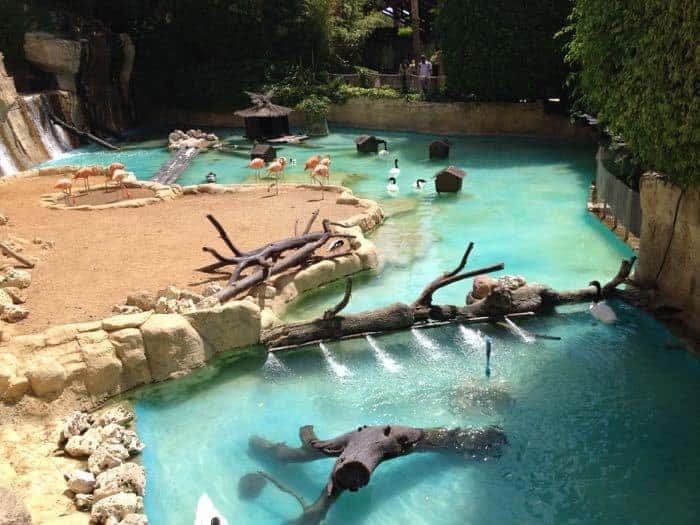 The zoo keeper experience was recommended to us by Visit Benidorm, but we didn’t have chance to fit this into our hectic whistle-stop schedule. Paul’s daughter enjoyed the keeper for the day experience for her birthday and she says it was the best party ever. Trip Advisor reviews are very positive too. 8 – Visit one of Benidorm’s Sandy Beaches. Both Levante and Poniente are long fine sandy beaches with shallow entry to the clear Mediterranean Sea with plenty of amenities nearby. 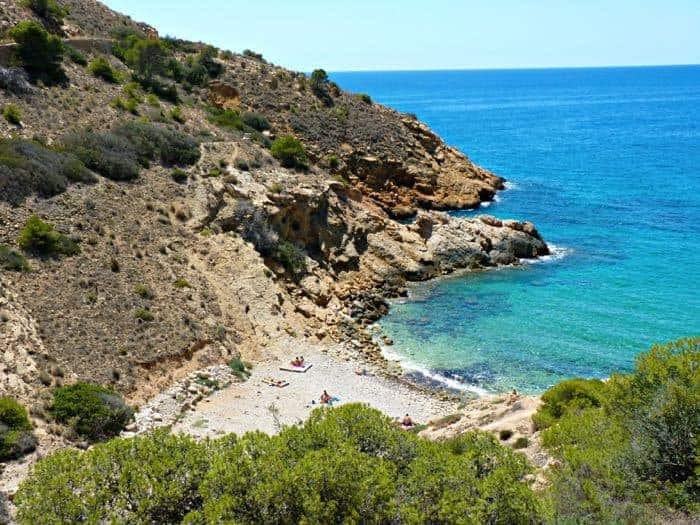 Paul, the British expat Dad, recommends Poniente for families (as its quieter than Levante) and at the far end, his daughters love La Cala Beach where they can go crabbing and explore rock pools. He recommends finding a shady spot if you can’t avoid the heat of the day. The beautiful golden sand does get very hot so flip-flops or beach shoes are a good idea too! Whether you fancy a quiet cove or being in the thick of all the amenities, there’s plenty more info on beaches, accessibility and features on the visit Benidorm website. 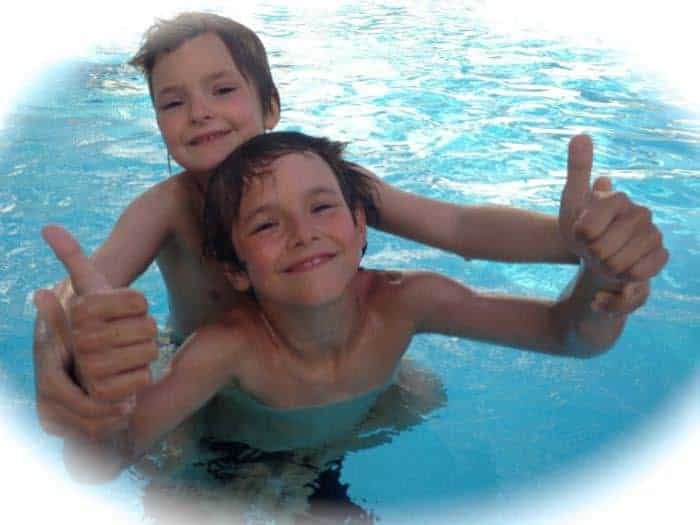 We had some amazing experiences out and about in Benidorm but we also valued our free time when we could cool down, have a dip in the hotel pool and relax. The boys seem to have a permanent smile on their faces when they’re messing around in the water. 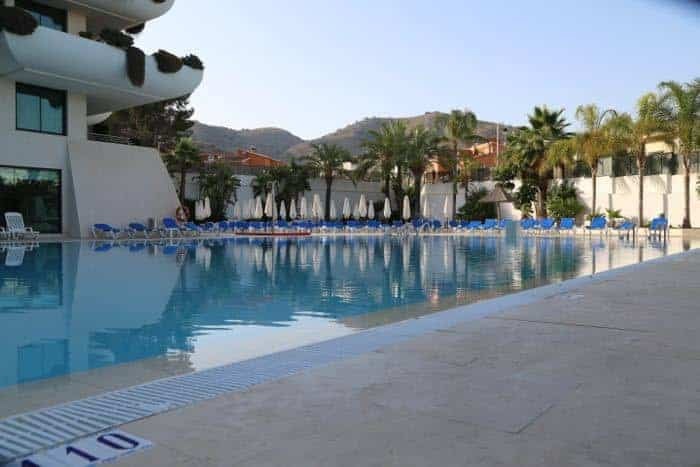 We were guests at Hotel Deloix, which has a main outdoor pool, a toddler water park and an indoor pool complex. I love the view of the mountains and the trees softening the edges of the pool area. 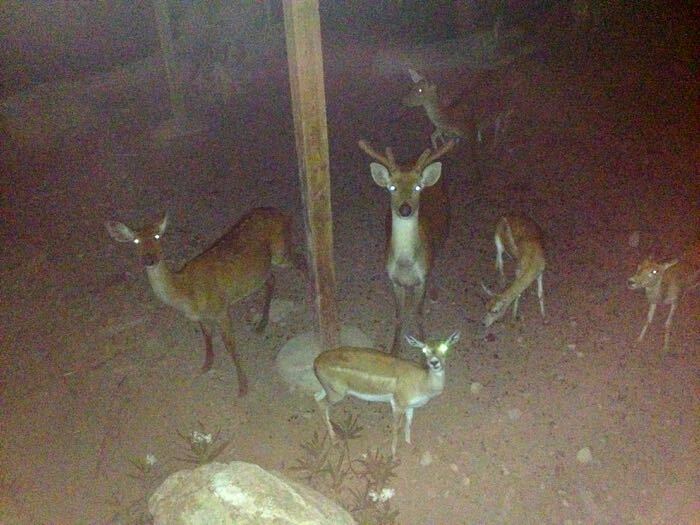 If you and yours have any energy left you might like to go on a night safari. Because it’s so hot during the day, many of the wild animals here wait until dusk to become active and hunt. Our safari started at 10.30 pm when the high temperatures had dropped so it’s more pleasant for us humans to stroll around the zoo too! The children particularly enjoyed feeding the animals in the dark. Although we visited in July when local schools had broken up for the holidays, none of the attractions seemed particularly busy and queue rides at the parks were virtually non-existent. 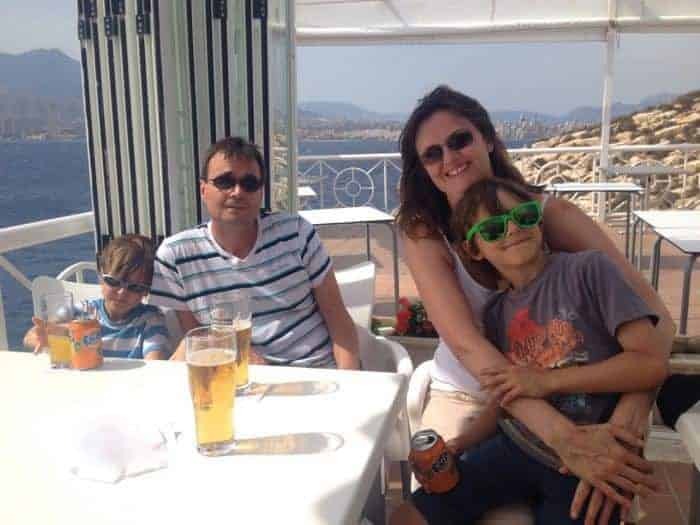 We had an amazing time in Benidorm and wouldn’t hesitate to recommend it to other families as long as they can handle the heat. In fact we’re looking forward to returning with my eldest son who couldn’t come this time. We just need the nine year old to grow another two centimetres . . . ! If you’d like to find out more about visiting Benidorm with your family, have a look at these related articles. Oh, despite being Spaniard, I have never been to Benidorm because had the same feelings about the city like you. I didnt know there are so many things to do, it looks really fun for the kids! 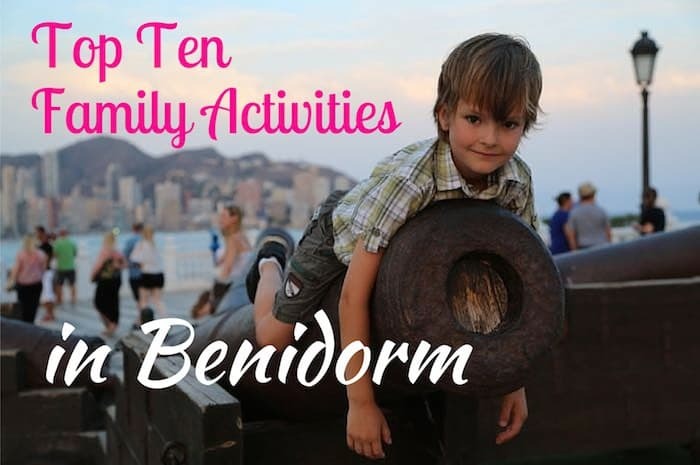 Great tips for family holidays in benidorm. 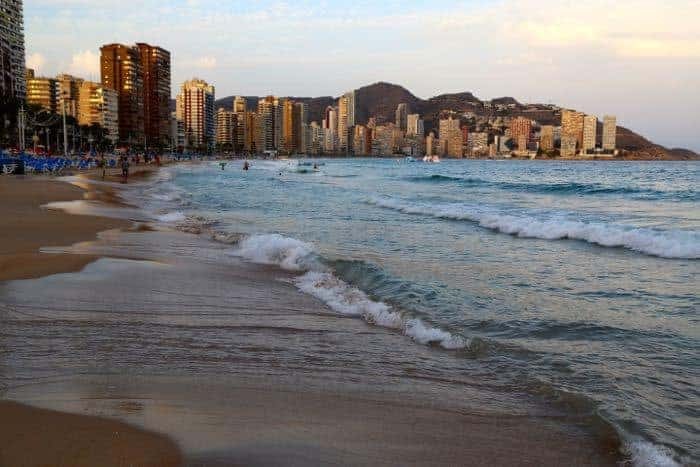 Benidorm is wonderful for kids, people sometimes overlook it but it also has it’s share of culture too which will interest the young ones but also not overwhelm them. I remember having a great holiday there with my parents! I bet kids would enjoy the Yellow Submarine! Aaahhh! What a cute little thing! 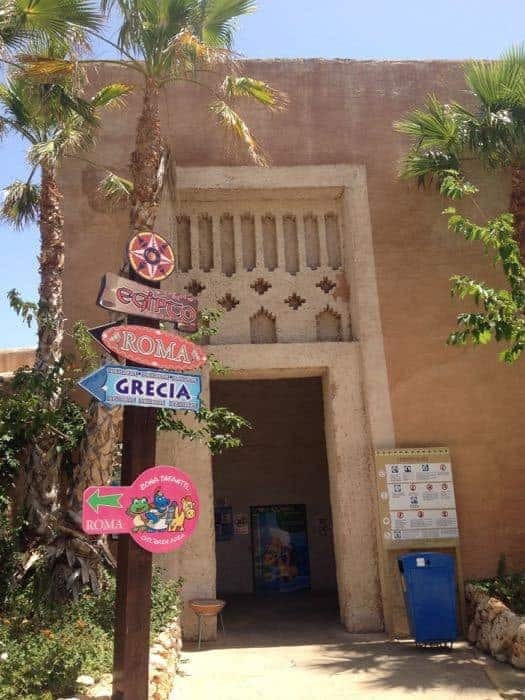 Love Aqualandia and Terra Mitica – great memories of both places. There’s also so many lovely towns, villages and beaches around the area too – so much more than burnt tourists! Neat water slide and amusement park. Great choices! I would love to do all the activities you mentioned even though I am an adult. They sound so fun. 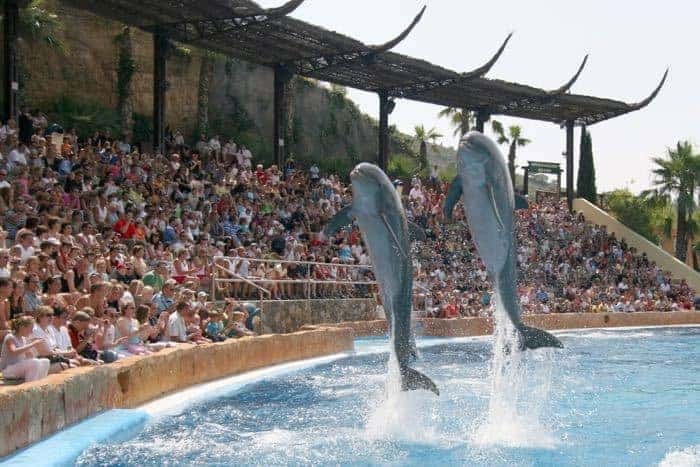 I was thrilled to have watched a dolphin show in the past. This creatures are amazing! The zoo keeper for a day sounds great too.